It's all cleared and they are ready for action! 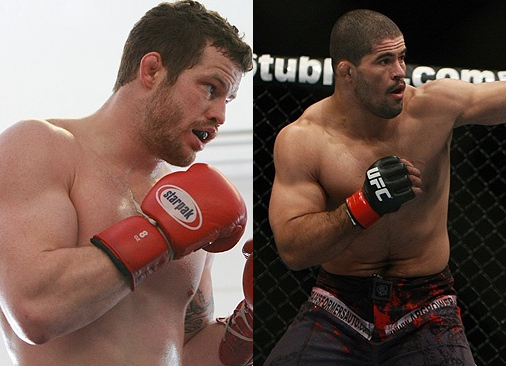 Both weighing 186 pounds, Nate "The Great" Marquardt versus Rousimar "Toquinho" Palhares is full speed ahead in headlining the UFC Fight Night 22. Middleweight fighters Nate Marquardt and Rousimar Palhares have been weighed in and cleared for their headlining bout at UFC Fight Night 22. Both contenders weighed in at 186 pounds. The 31-year-old Nate “The Great” Marquardt made his MMA debut in 1999, and earned various titles before joining the UFC. One of the pioneers of Greg Jackson’s MMA squad, he will rectify his trail after a defeat with Chael Sonnen at UFC 109. But preceding that, The Great had reeled off straight victories over Demian Maia, Martin Kampmann and Wilson Gouveia. Rousimar “Toquinho” Palhares, on the other hand, carries with him a three-fight winning streak. The dangerous Brazilian Jiu Jitsu black belt nicked wins over Lucio Linhares, Jeremy Horn and Polish import Tomasz Drwal. The event that is set on Wednesday, will take action on Frank Erwin Center in Austin, Texas. UFC Fight Night 22 will also feature the Efrain Escudero vs Charles Oliveira fight. However, Escudero will forfeit 20 percent of his money bag over to Oliveira, as the bout is considered a catch-weight affair.